The generating station either of d.c. type or of a.c. type, normally consists of number of smaller generators operating in parallel instead of large single unit capable of supplying the maximum load demand. These smaller units can run in single or in various parallel combinations to supply actual load for following different reasons. The most important requirement for any generator is its continuity. This can not be achieved if there is a single unit as in case of breakdown of prime mover or generator. there will be total unavailiability of the supply. This also affects the reliability of the supply. The requirement of uninterrupted supply is important in case of industrial loads as otherwise the economy may get affected. Thus instead of having a single large unit, Number of small generators are operated in parallel. It is required to have a periodic checking and inspection of prime mover and generator to avoid the possibility of total breakdown or shunt down in future. If any of generators in under maintenance or repair then the load on that generator can be shared by other generators as all of them are working in parallel. Thus in case of failure or breakdown in any of the generators, the generator can be repaired with more care as other generators are available to maintain the service. The load on the generating station is never constant. It varies from time to time with maximum demand occurring during morning and evening while minimum demand during late night hours. Most of the generators operate efficiently when delivering the full load. Thus when there is light load condition, it is economical to use a small, single unit. With increase in load demand, a large generator may be put in service instead of a smaller one or another smaller unit may be connected in parallel with the earlier unit which is already in service. Additional generators are always installed in existing paint to supply increasing load demands. Provision for the future expansion is made from the begining itself. 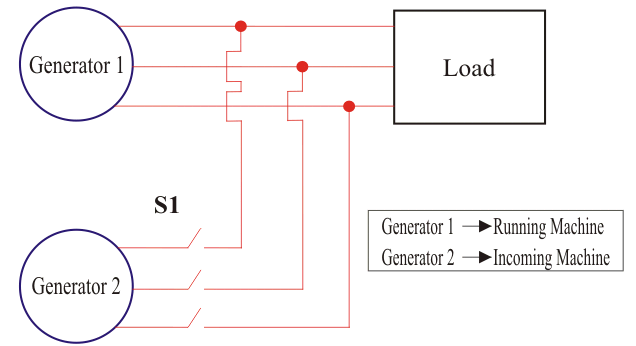 If number of generators are operating in parallel then it is easier to add other generators for parallel operation with increase in load demend.